There will be another post on landscaping coming shortly, but does anyone have any experience using evergreen “ground cover” as a lawn replacement? We were thinking about just sodding some lawn in initially, but this weekend, we saw some interesting stuff called Stepables which is essentially a collection of evergreen plants you can use in lieu of grass. The stuff apparently only grows 1 or 2 inches tall, never needs mowing, and can be trampled on almost as vigorously as a traditional lawn. My feeling about lawns is that they are only as nice as the time you’re willing to put into them, and I can’t say I’m willing to put a ton of time in. 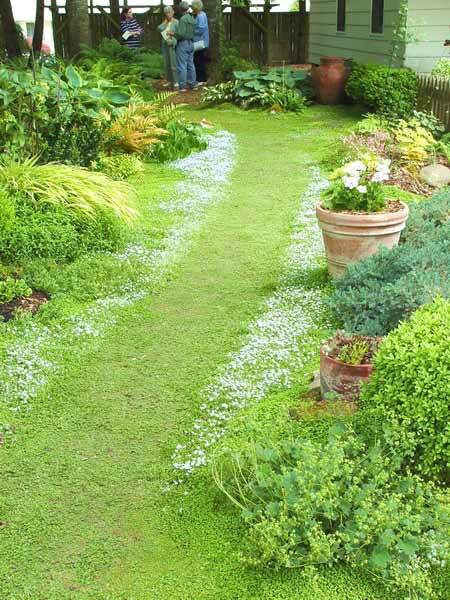 Evergreen ground cover seems like a really attractive option, although I can’t say I know anyone personally who’s tried it yet. It doesn’t seem to look quite as good as a nicely mowed lawn, but I’d settle for decent looking if it meant zero maintenance… especially if I could walk on it to release an awesome minty fresh scent. This stuff is called “Blue Star Creeper”. Sounds smokable. This Sunday was a very sad day for me. 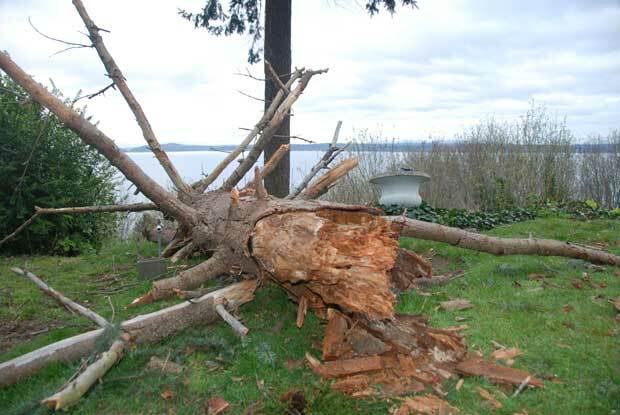 During a weekend visit to the property, we became aware that the beautiful, mature, giant Douglas fir tree standing majestically on the hillside next to us had snapped in half during a brief period of wind gusts on Saturday. 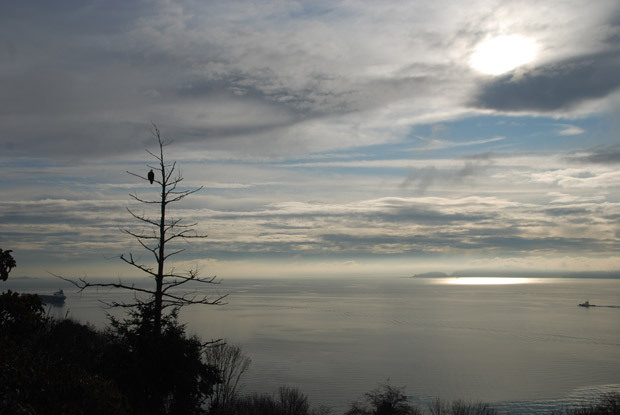 For probably about 75 years, this beautiful tree has hosted bald eagles, osprey, and thousands of other birds scoping for prey, cleaning their feathers, or just enjoying a nice view of the Sound. 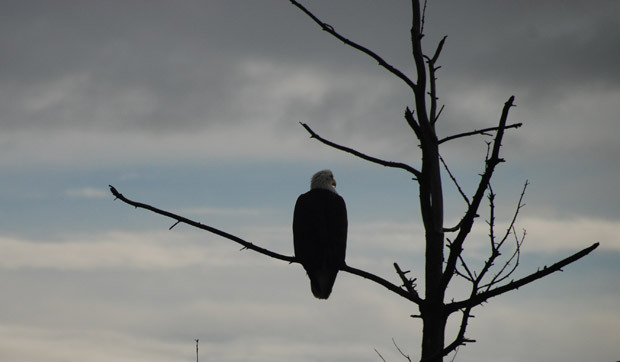 I’ve seen as many as three bald eagles on this tree at once and it was one of the first things that attracted me to the property. This guy got a few minutes of alone time before his buddies showed up. This is what the tree looked like before this weekend. 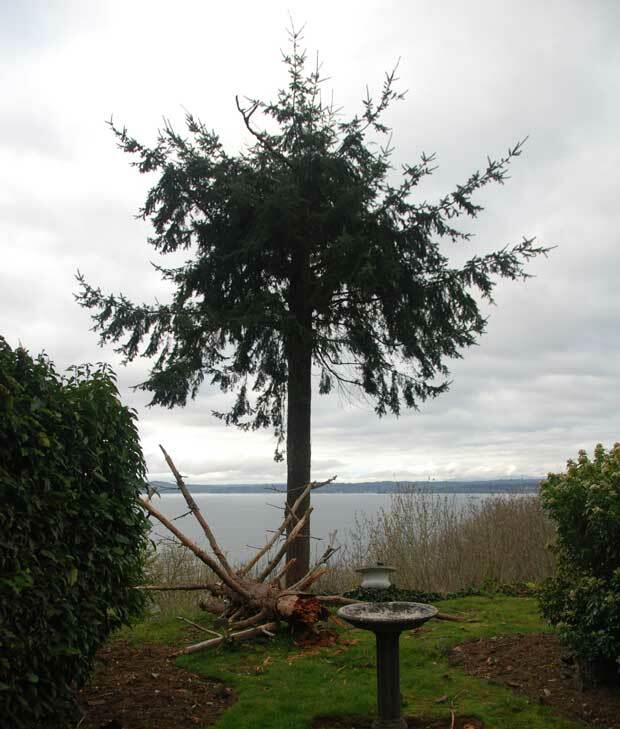 The top portion of the tree had been dying for quite some time and I never expected any regrowth, but neither did I expect the 18-inch diameter upper trunk to snap completely in half during what I would consider fairly moderate winds. The right gust must have just hit the right angle for the right duration and the old guy cried uncle. This is what the tree looks like today. A close-up of the carnage. We’re only four or five weeks away from finally moving in, so it’s incredibly sad to see our favorite element of the landscape decimated before we could really enjoy it, but on the bright side, the tree itself is still up, and what remains is alive and presumably well. It’s still high enough to where the eagles may come back (fingers crossed) but it just isn’t the same without those thick bare limbs providing the equivalent of park benches to our high flying neighbors. First-world problems, yes, I know… but it’s still incredibly sad. I would have rather seen every piece of vegetation on my property go before that tree. As the house nears completion (hopefully only about four weeks away! ), we’ve spent the last month researching landscaping options. I’ve heard that most new construction projects end up devouring the homeowner’s entire budget and landscaping is usually the first item to get axed, so I’ve been anticipating that the same would happen with this project. Thankfully, we’re currently still less than $10,000 over our original budget so we can follow through with landscaping. In talking to a few landscape design firms, it quickly became clear to me that “landscaping” can be as cheap or expensive as you want it to be. For $500, you can put a lawn in, and for $250,000, you can create your own Buchart Gardens. Solo design/landscapers may charge as little as $25 a hour while high end firms are closer to $100. My problem with spending a lot on landscaping before we even move into the house is that I’m really not sure what sort of scheme will work best yet. There are a few things we know we want like black bamboo and an understated Japanese motif, but beyond that, it’s a crapshoot. For that reason, we’ve hired a woman named Alex Tomy (of Alexandria’s Creations) to collaborate with Build on a design that will get us off to a good start and let us make any modifications or enhancements later. Alex has been taking care of two of our neighbors’ houses for over 10 years so she knows the micro-climate better than anyone. While Build handled the hardscape design, Alex is handling the flora. We decided to concentrate 80% of our effort on the front yard and 20% on the south side yard for now, since those are the areas in most need of design. The backyard (pictured in the header of this blog) is already beautiful, and although it will get a trim and a bit of a refresh, it can wait. We also decided to go with a ryegrass/fescue lawn in front, despite some earlier flirtations with ground cover. Thanks to Dave’s encouragement, I think we can easily handle the small amount of maintenance that this will require… and if not, there’s always neighborhood kids to do the mowing. We will, however, be using ground cover in the backyard when we get around to it. Finally, we also decided to line the house and many paths leading to and around it with black mexican beach pebbles. See this concrete path for the inspiration behind the idea. I’ve always loved this look, and for about $1300, we got 6000 pounds of them… enough line the entire house and probably also create a fire pit with. I don’t have the final bills for landscaping related stuff yet, but I estimate the actual planting part of it (i.e. minus the hardscapes, decking, etc.) will come around $7,000. The front yard and and landscaping turned out to be one of the most pleasantly surprising parts of the entire project. Having never owned a house before and knowing very little about gardening or landscaping, we assumed the (one woman) team at Alexandria’s Creations would do a nice job for us but that we’d probably want to change a lot of stuff later on. Alex’s work, however, has turned out so beautifully that we don’t foresee wanting to change a single thing, provided all plants adapt nicely to their new environment. A few months ago when landscaping work began, I posted details of what was going in where so I won’t rehash that again, but there are a few other details to discuss, now that everything’s done. For one reason or another, I decided to axe irrigation from the budget early on… probably because we were looking for stuff to cut in order to hit a number. As landscaping plans came into focus, however, it became clear that skipping irrigation now would only mean a year or two of laborious manual watering followed by a destructive installation of proper sprinklers later. For that reason, we added it back into the plan just in time and the folks at the Hale Company came in and did a wonderful job for us. Because the driveway was already poured, Gary and the Hale team had to bore a small hole underneath it to run water there, but other than that, the install went smoothly and took about a week. We created 4 sprinkler zones for the front and side yards and ran a water line to the backyard for if and when irrigation would be installed there. 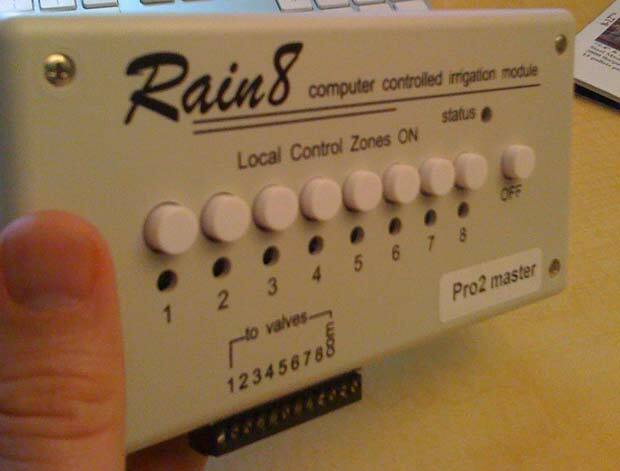 In order to tie the irrigation into our home automation system, we used the Rain8Pro from WGL Designs. It’s probably the single ugliest piece of equipment in the entire house, but it’s also one of the best irrigation controllers on the market. Because it ties directly into the automation system, we can trigger it with moisture sensors, on a timed schedule, or even from a web browser or iPhone. The Rain8: Beaten repeatedly with an ugly stick but still outperforms its peers. So far, the lawn has not proved to be very difficult to maintain. It needs a little more watering than the plants, but since it’s flat and not very big, I can cut the whole thing with a manual push mower in less than 10 minutes. We’ll see how long I go until calling a neighborhood kid in to do it, but right now, I don’t mind it at all. I think there’s a difference in having a lawn you have to mow versus a lawn you want to mow. Right now, I’m in the second camp. 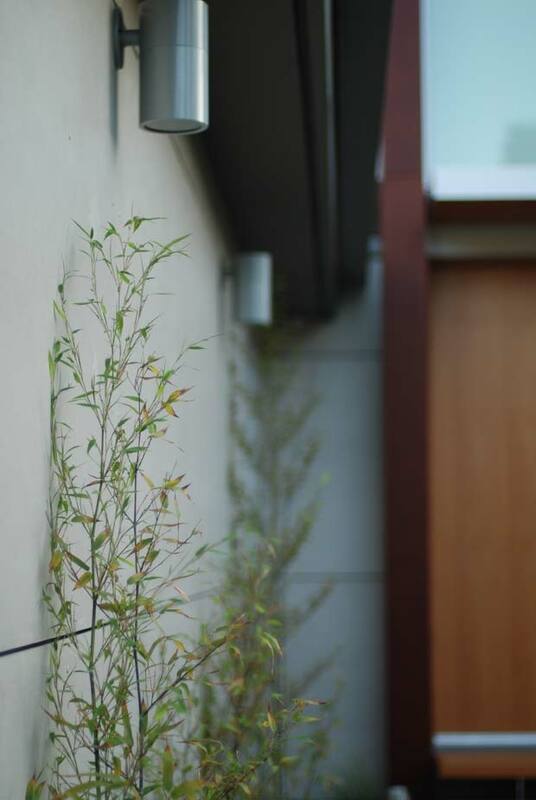 Landscape lighting isn’t too complicated of a subject once you get the hang of it, but I have to say, it’s pretty hard to find nice looking modern landscape lights. 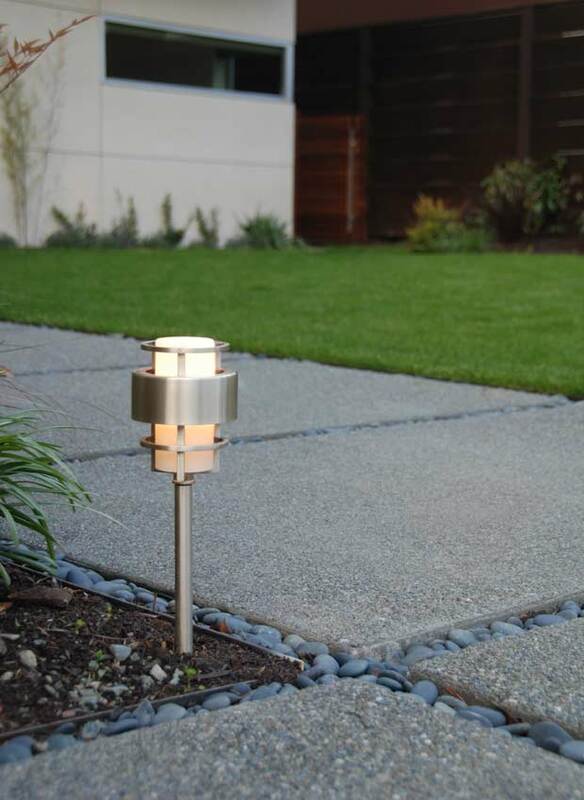 It seems like 99% of all landscape lights are either very traditional or very cheap looking. I thought briefly about using solar lighting, but after trying it in the back yard, I found it doesn’t really flood areas with any reasonable amount of light. The ones I found all used a tiny single LED bulb which only spread light across about a two foot radius… and spottily at that. Through the advice of someone on Twitter, I called Sidney Genette at Lighting Designs and hired him to put together a basic lighting plan for the front yard. I didn’t end up using the equipment he spec’d because I found fixtures I liked even better, but Sidney’s plan successfully lit up our paths, our lawn, and our plants. We ended up going with some pretty expensive downlights in the BK Lighting Alpine PAR 30 (purchased from Stoller Inc.), some moderately priced path lights in the Hinkley 1579SS (purchased from LightingSale.com), and some super cheap uplights in the Malibu 20 watt cast metal flood (purchased from Home Depot). These are the BK Lighting downlights. Solid as hell. Maybe 15 pounds each. Kind of overkill though. 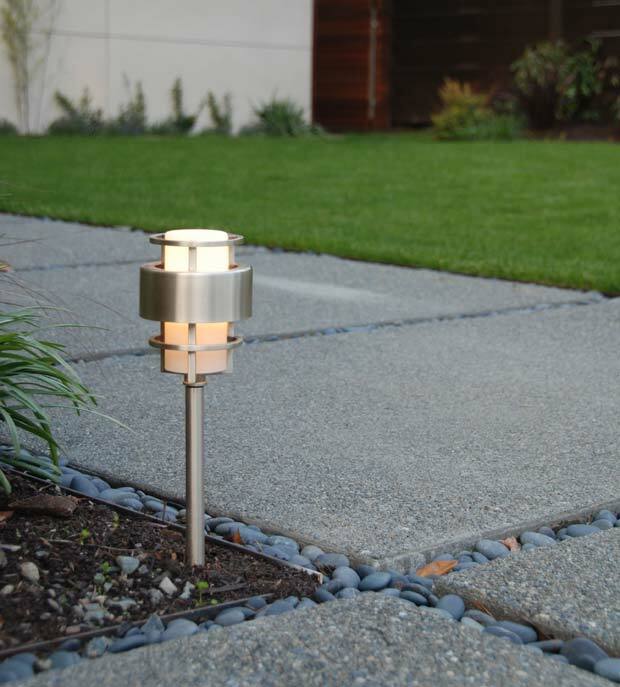 The Hinkleys are the real superstars, lighting up the walkway to the front door and providing a nice, modern, subtle accent to the concrete path, even in the daytime. If the Hinkleys are an A, the next closest path light I found was maybe a C-. Mmmm, the Hinkleys. 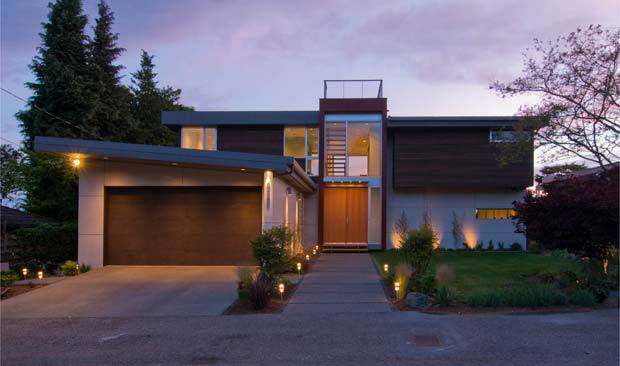 So modern, so smooth, so perfect. Since we did so well on the overall house budget, Alex will be coming back in a week or so to landscape the back yard. It’s already beautiful so I can’t wait to see how it turns out. I just posted a bunch of front yard photos to the photo gallery, so feel free to check them out here.